After food, there is probably little that excites the French as much as sport (Sport in France). A nation of proud sportsmen, the French are internationally successful in many sporting spheres, among them football, rugby, skiing, cycling, sailing and many more, too numerous to list. Eavesdrop on any conversation taking place in a French café or bar (quite possibly, the place will be named "Le Café du Sport") and you will hear the locals talking about food (Buying and cooking French food) or sport. Very often, the conversation will appear to become heated, with Gallic passions inflamed by their love of their chosen teams. Unsurprisingly then, sports clubs are hugely popular in France, often with a lively social side attached. There are numerous reasons why the French are successful in many sports. To begin with, the natural resources of France positively invite participation in certain sports. 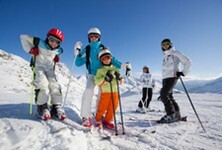 Consider, for example, the sport of skiing (Ski property, Ski Chalets for Sale in France). Top British skiers are few, and even at the top, less successful than the French. There is, of course, no mystery to this, as where Britain has only really a handful of mountains that receive enough snow to make skiing viable, France has an extensive choice of snowy slopes on which to hone the skills of its skiers: the Alps (Alps property), the Massif Central, the Pyrénées (Midi-Pyrénées Property Guide) and the Vosges (Vosges Property Guide). Skiing is just one case in point. Take also the Mediterranean Sea (ideal for yachtsmen) and the Atlantic Ocean (perfect for surfers, The French Atlantic Coast) and the leisure lakes that are found all over the country and which are a wonderful, safe training ground for the development of these and other water-based skills. The rivers and gorges provide the possibility of white water sports, while other adventure sports such as climbing and mountain biking are also well catered for thanks to the mountains and hills that exist in many areas. Then you have the diversity of terrain that is so good for road cyclists, and the mountain training grounds that provide high altitude fitness training for athletes. 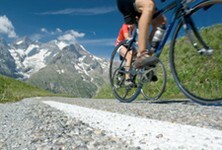 France has so many natural advantages, it is hardly surprising these sports thrive and the participants excel. There is another reason why France is a sporting nation par excellence, though, and this is the culture of sports clubs and encouragement to join them that pervades the country. Not only do these clubs nurture competitive youngsters, but they also provide access to sports of all types for all ages to exercise, and to have fun. Children are encouraged to join sports clubs from a very young age (French Education System - Schools in France), and thus tend to spend far more time engaging in these pursuits than their UK counterparts. It is rare to find school age kids who don't participate in at least one sport through a club in their own time, and many are involved with two or three. Adults too join clubs to play football, rugby, tennis and other similar competitive and team sports. The sports club scene is far more active in France than in the UK, and prices are usually kept low so to provide access for all. This cannot possibly be an exhaustive list, but among the most popular clubs are football, rugby, swimming, skiing and cycling clubs. Youngsters, who are at school, usually attend such clubs during Wednesday afternoons, which are free time in most of the country, or after school and at weekends. Among other sports represented by clubs are swimming, tennis, scuba diving, sailing, windsurfing, surfing, climbing, canoeing, athletics, archery and pretty much anything you can think of! Horse-riding clubs and "Pony Clubs" can be found everywhere, and once again, make the sport more accessible and appealing to young people from all different backgrounds rather than being the more exclusive activity that it tends to be in Britain (Horses in France). Cycling clubs are legion, and attract all ages (Cycling and motorcycling in France). It isn't unusual to see large groups of elderly gentlemen dressed in their fluorescent lycra effortlessly pedalling up the mountain roads on Saturdays and Sundays throughout the year, presenting a picture reminiscent of a geriatric Tour de France! France is very cycle friendly, with most motorists being "cycle aware" and treating cyclists with great respect, and most towns will have a cycling club attached. Many areas of France have reasonable access to mountains and ski resorts, and those clubs in towns within driving distance of these usually organise transport, equipment hire and even accommodation for longer trips through the clubs, at a very minimal cost. Ski clubs are frequently affiliated to chains of sports shops, which offer discounted rates for members for hire or purchase of equipment. The same goes for sea-based sports, such as sailing (Property near Sailing Ports / Marinas in France), surfing or scuba diving, with clubs arranging to take their members to the marinas or surf resorts in addition to helping with training, arranging competitions and arranging discounts for equipment hire. There are plenty of gyms and fitness clubs in France, but they tend to operate as private clubs, often quite small, rather than as part of large leisure centres as in the UK. Memberships are not normally expensive, but be aware that some operate a system whereby you book your time there in advance rather than just turn up and train. The French passion for petanque also gives rise to the existence of clubs in most towns and villages throughout the land. The game is beloved of all ages, and is played at all levels of competition from local to national. France is a country that loves its lakes (French Properties with Lakes, Fishing in France), and there are few places that are too far from a leisure lake to be able to enjoy the facilities. With many, you can become a member of the lake's own club, which entitles you to discounted rates from lessons and hire of boats, windsurf boards and other equipment. Or you can enjoy the lakes in your chosen sport through a local club, many of whom will have negotiated a season pass with the lake management. As well as clubs that are attached to towns, there are other organisations and bodies that run their own clubs, often giving public access. These can be found in the most surprising of places at times. The French Foreign Legion, known to many through the desperado days of Beau Geste, has come a long way since its early days of recruiting criminals, and is now a highly respected force for good in not only military circles, but also in its garrison towns. Castelnaudary (Castelnaudary Property Guide), in the Languedoc, home to one of the Legion's big training bases, has extensive state of the art sports facilities, and allows the public to join their various clubs to use these at allocated times. The superb swimming pool is used as a training pool for scuba divers, and the associated club trains amateur divers to a level where they can obtain their certificates of diving competence and also in first aid. The club also arranges diving trips to the sea, providing a qualified instructor/monitor, equipment and transport. The Foreign Legion also run ski clubs and trips, summer camps in the mountains where youngsters can try rock climbing, canyoning, horse-riding and other sports, all under expert guidance. My own children belonged to our local ski club for some six years, variously enjoying twice weekly skiing during the winter season in the Pyrénées, our nearest resorts, and week long skiing holidays in the Alps, all for not much more than the price of a good dinner in a restaurant! They received discounts on hire or purchase of any sporting equipment from the participating sports shop, and transport was provided either through the goodwill of other members who would offer spare places in their cars, or through the hire of a mini bus or coach, funded through the club. The atmosphere was remarkably friendly and helpful, even in the early days after our move to France when my children spoke little French. And when my daughter broke her leg in a skiing accident, members of the club accompanied her throughout the long trip in the ambulance and waited with her at the hospital until we were able to get there, all done with a smile and the greatest of kindness. Not only was this immediate help offered to us, but the club also guided us through the rather complicated process of claiming on the ski club's insurance policy to cover all the medical costs of the accident (Health care in France). "All part of being a club", they told us, and this attitude does indeed seem to be the case. Sports clubs in France are thriving, and long may they continue to do so. They make participation in sports accessible and widespread, which can only be a good thing for the country and its people.